Secretary of State Condoleezza Rice on Friday criticized Sen. Barbara Boxer’s suggestion that because she doesn’t have family in harm’s way, she won’t pay a personal price in the Iraq war. “In retrospect, gee, I thought single women had come further than that, that the only question is are you making good decisions because you have kids,” Rice said in an interview Friday on Fox News. 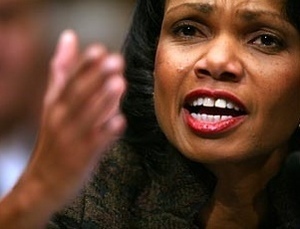 As you can see in the photo above, Condi is practiced at exuding Motherly Love in every nuanced look and gesture. She’s holding out her hands for an infant… to devour, I guess. Crocodiles do it. That’s her version of feminism. But oh, my, has the Zionist-controlled media had a field day with this one, rapaciously smearing and defaming Boxer. What’s interesting is that another story in the news may provide enlightening insight into the issue. In this story we are told that a totally normal, middle-aged couple slaughtered four neighbors, including a 2 year-old child, by stabbing them and cutting their throats. “We just could not stand them anymore,” Bazzi, a petite housemaid obsessed with cleanliness, told investigators as she confessed to killing the two-year-old with a knife. “He was always screaming, my head was exploding,” she said, according to media reports. Bazzi, 43, was unable to have children, which Italian media have suggested as a possible cause of her anger with the sound of the child’s crying. Now, one could draw a comparison between the childless Bazzi and Condoleezza Rice who is just sooo upset with the “noise” made by crying Palestinians, Iraqis and Iranians and anyone else who is not as obsessed with democratic cleanliness as she is. “They are always screaming, my head is exploding,” she says in actions, if not words. Condi and Bush and the rest of the Ziocons would like to be able to say to each other: “See how peaceful it is now? We can finally sleep well.” But they know that this can only happen after they cut the throats of every crying Palestinian, Iraq and Iranian child. And it sure makes it easier for a woman to do it if she doesn’t have children herself. Condoleezza Rice has described the plight of Lebanon as a part of the “birth pangs of a new Middle East” and said that Israel should ignore calls for a ceasefire. “This is a different Middle East. It’s a new Middle East. It’s hard, We’re going through a very violent time,” the US secretary of state said. I have to say that, as the mother of five children, these remarks stopped me cold in my tracks. 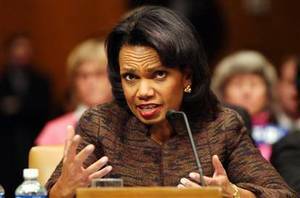 Aside from the obvious question “what can Condoleezza Rice – a woman who has never given birth – know about “birth pangs? – there is another more compelling question: what kind of human being can be so callous as to say such a thing when tens of thousands of mothers in the Middle East have suffered the unimaginable grief of seeing their beautiful babies whose birth pangs they DID experience, crushed under the jackboots of rapacious Imperialism and religious fanaticism with War Whore Rice leading the charge? Few things have ever revealed the psychopathic nature of Condolizzard Rice more clearly than this soulless and truly inhuman series of remarks. Rice has revealed herself to be – like Benny Morris – a morally repellant creature. A crocodile would make a better mother than she would. As Norman Finkelstein has pointed out, the universe inhabited by normal human beings – honest and decent people – is one where the majority concur on the facts AND their moral and legal implications, though they may have different ideas of how to implement a political solution. One could say that all NORMAL people demand an immediate cease-fire. Period. You can work out the details later, but stop NOW before one more precious baby is lost and one more mother regrets the real birth pangs that brought her child into a world where he or she was destined to become only cannon fodder for such as the likes of Condoleezza Rice. WASHINGTON – Secretary of State Condoleezza Rice on Friday criticized Sen. Barbara Boxer’s suggestion that because she doesn’t have family in harm’s way, she won’t pay a personal price in the Iraq war. Boxer’s comment came during a Senate Foreign Relations Committee hearing Thursday in which Rice was grilled on President Bush’s new war plans. “Who pays the price?” Boxer asked Rice, who is unmarried and doesn’t have children. “I’m not going to pay a personal price. My kids are too old and my grandchild is too young. You’re not going to pay a particular price, as I understand it, with immediate family. Boxer, D-Calif., defended herself in a statement Friday. Condoleezza Rice, President Bush’s nominee for secretary of state, refused Tuesday to set any timetable for the withdrawal of American troops from Iraq, but declared that the United States was making “some progress” in training Iraqi security forces. …By far the most severe questioning came from Senator Barbara Boxer, a California Democrat, whose berating tone clearly rankled Ms. Rice and brought an uncharacteristic flash of irritation. 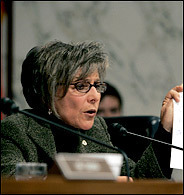 In the morning session, Ms. Boxer focused sharply on Ms. Rice’s position that Saddam Hussein had been close to acquiring nuclear weapons, showing her statements on a cardboard display. Just what IS your nature, Condolizzard? Forget about credibility and integrity; they are rags and tatters by now.